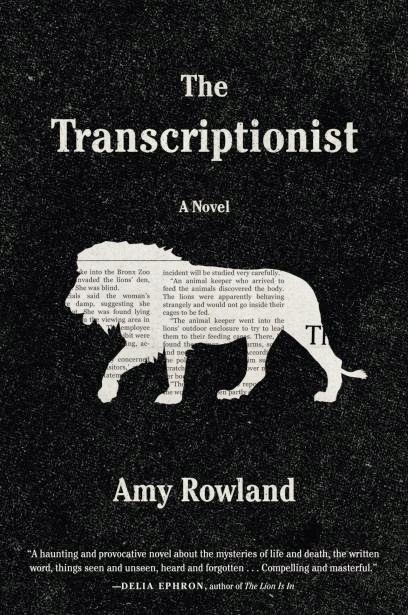 When reading The Transcriptionist, I felt like I was reading something extraordinary, something to carefully digest. I'm not even sure how to review it. It is such an intricately woven story that I feel like anything I say just sounds hamfisted and cliched. I want to call it transcendent, transformative, intelligent, quiet. I want to say that I haven't read a book this good in years. I would like to point out that it should be made into an intelligent indie film possibly starring Jessica Chastain and definitely not Amy Adams. I can't really think of the right words to say to let you know how wonderful I think this novel is. It's the story of Lena, the last transcriptionist an important fictional newspaper in New York City in the post-9/11 era. Most reporters use digital media to record and report their stories, but a few still call in to her phone line or bring her analog tapes, and she transcribes them for publication. Stories flow through her without her impact ever being known and without impacting her. But one day she reads the story of a woman who commits suicide by jumping in the lion's den at the City Zoo ,and she can't shake that story; she realizes that she had a chance encounter with the same woman a few days before. The Transcriptionist is about all the stories that aren't completely told, stories that are edited, stories that are never finished, stories that are deemed unimportant. Lena carefully crafts the story of the dead woman's life when the assigned reporter has already given up and moved on. She knows that the dead woman's life is more than just 15 minutes of fame, and there are striking similarities with her own life. I think we all feel like we've been to New York a hundred times because we see it so many times in film, books and on television. But this is an unseen New York. Lena's New York is quiet and sometimes lonely, although not desperately so. Even though some of the glamour and celebrity that we're used to seeing in New York stories does filter through second and third hand, the transcriptionist lives a mainly quiet life amid the chaos. She doesn't really have a voice of her own at first, and this novel follows her as she develops and finds one. That sounds like such an interesting book! I just added it to my Goodreads list. Thanks for sharing!